The Irish Football Association has been fined 7,000 euros following pitch invasions by supporters as Northern Ireland qualified for Euro 2016. The Uefa fine was imposed as a result of fans encroaching onto the playing area during and after the victory over Greece at Windsor Park on 8 October. 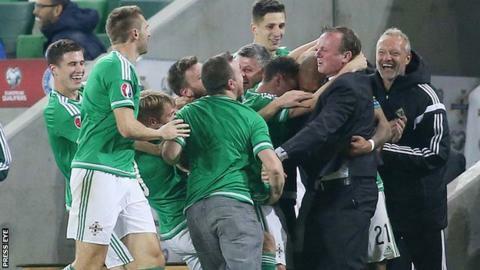 Northern Ireland won the match 3-1 to secure their place at next summer's Euro 2016 finals in France. The Irish FA has confirmed that it will not be appealing against the decision. The sanction for the pitch incursions was imposed by the Uefa Control, Ethics and Disciplinary Body. The victory over the Greeks sparked scenes of wild jubilation as Northern Ireland reached their first major tournament in 30 years.